My name is Liam Cunningham and I am the president of Young Harris College’s TU 5Rivers Fly Fishing Club. This is our first year as a program and we are trying to do our best to spread our love of fly fishing and conservation around our area. One of the ways we plan to do this is by bringing the Fly Fishing Film Tour to Young Harris. We are looking to attract people from all over North GA, North and South Carolina, Tennessee and surrounding areas to Young Harris to share the passion of fly fishing. We invite you to join us on Saturday, April 8, 2017 at Young Harris College Rollins Campus Center for the 11th annual Fly Fishing Film Tour (F3T). Participate in our casting competition, visit with area outfitters, guides and fellow fly fishing folk starting at 5:30pm. Dinner will be served at 6:30pm with films beginning at 7:00pm. Proceeds will benefit Healing Waters, Hiwassee River Watershed Coalition’s Corn Creek Project as well as YHC TU 5Rivers Fly Fishing Club. 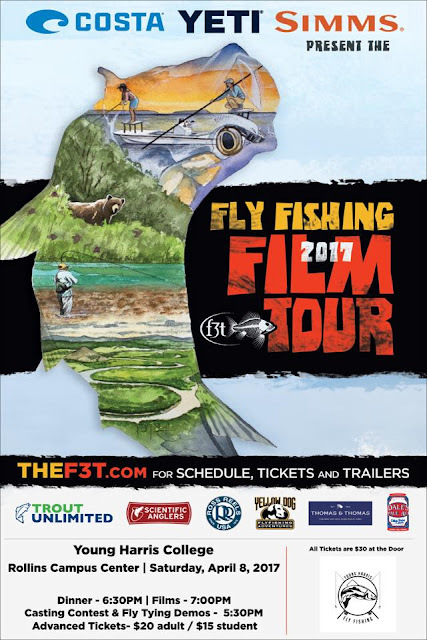 Advanced tickets may be purchased on the Fly Fishing Film Tour website or at https://events.ticketprinting.com/event/22997 by April 4th and are $20 adult and $15 with a valid student ID. All tickets purchased at the door will be $30. Please share our invitation with your club members and other fly-fishing enthusiasts. For more information please call or email Hayley Burch, YHC Events at 706-379-5016 / hcburch@yhc.edu or myself at 912-373-5250 / lacunningham@yhc.edu. Our club would really appreciate your support. Come out, eat some food, enjoy great films and hangout with other fly fishers. We hope to see you there.